Concealers can be an easy way to cover the spots or blemishes provided if you chose the right color. They can be great in achieving a flawless looking skin, to vanish the dark circles and getting a brighter looking under eye area. 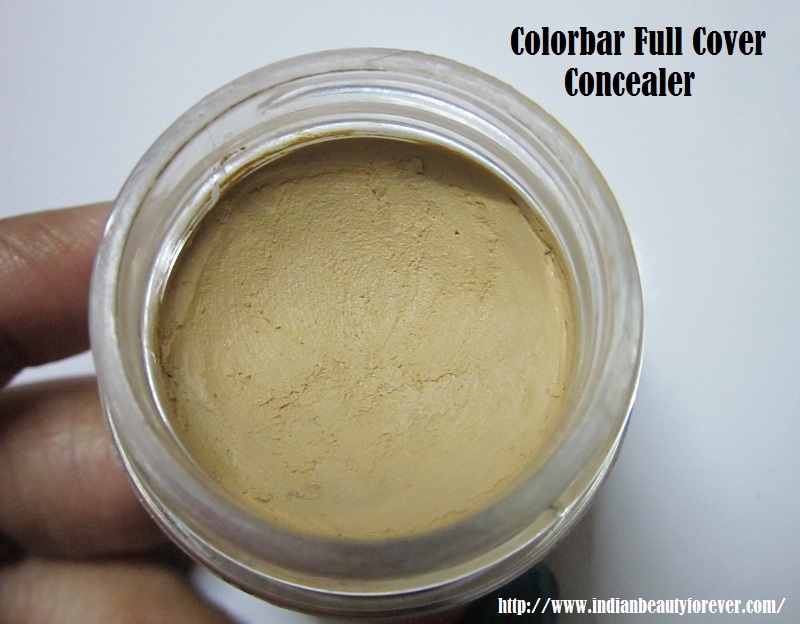 In this post, I will review Colorbar concealer which is meant for full coverage. I got this concealer around 4 months ago I suppose and have been using it for most of the times while doing eye makeup to cover the shadows under my eyes and some veins. Here we go, with the review. Price: It comes at 495 INR for 5g with a shelf life of 24 months. How to Use: The best way to apply this product is with fingertips as it will warm up the product before application. Pat lightly onto the places where you need to cover and then blend the edges away for smooth finish. It can also be applied with a firm brush or latex sponge. Ingredients: They are mentioned below in this picture and yup, it does have Preservatives …. Parabens !!! My Experience: This Colorbar concealer is ideally my first concealer as earlier only foundation was enough and I struggle more with the puffiness which is hereditary in my case than the circles under the eyes. But these days, I realized that due to busy schedule I have noticed some shadows. I say shadows because when I am outside they are not visible at all but in shade a little darkness under the eyes is visible. So, I have to be careful in applying concealer else outside it can look weird if it is used too much or not blended properly. This concealer comes in a round pot with a silver mirror finish lid. It looks like Nyx concealer in a jar. It is only 5g but it will last longer. It comes in 6 shades to choose from. I got mine in Sand beige 003. It’s suitable for fair to medium skin tones but I will recommend checking the shade at the counter under proper lighting. It does not have any fragrance. 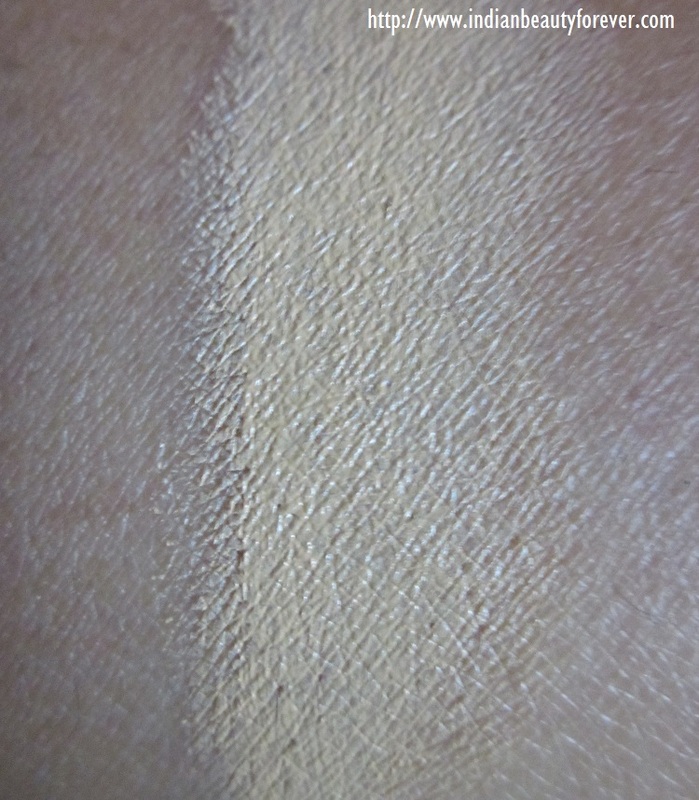 Texture of this concealer is very thick, but still creamy which is adequate enough to give proper coverage. It’s a jar packaging so I apply it with a clean finger or concealer brush. I also realized that it’s not easy to put finger in this tub as when I do that it gets into my nail, so, I think using a clean brush would be better. All you have to do is to pat it on the targeted area, lightly blend the edges and then set it with a powder. It says that it has SPF 25 so as to give UV protection. I use faces concealer brush. I have used it quite a lot of times and it is water proof upto certain extent only. While using concealer on the under eye area make sure to use your ring finger. 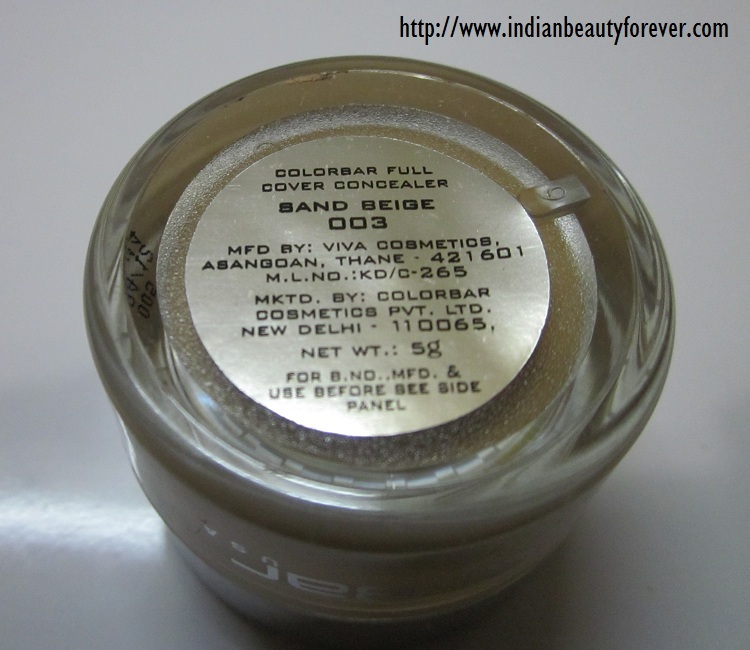 I also apply it on my lids before eye makeup to get rid of the redness or any pigmentation. This is the present condition of this concealer and it kind of gets a little dry so I swirl the brush on the top layer to warm it up. You can also scoop out a little and then use your finger which warms up the product more for better application. It looks more yellow in the pot. You can apply your concealer over or under your foundation, or if you can pat it on the area that needs coverage, skip the foundation and then use the compact only. 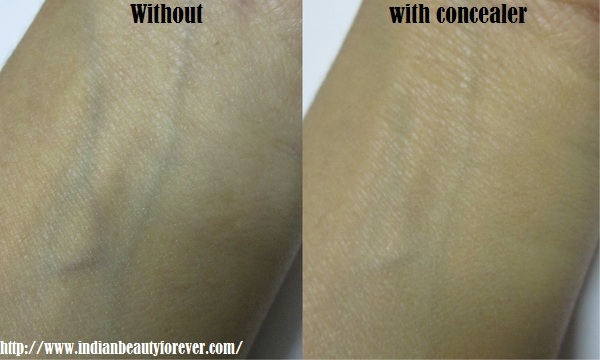 This is the swatch which is not blended and below is the picture to show how it covers the veins on my wrist area. In the picture above, I have used a little concealer on this area and patted lightly. You can see the effect and the coverage. It has covered the veins though not fully. Like most of the concealers it does crease. setting up with powder may help a bit. 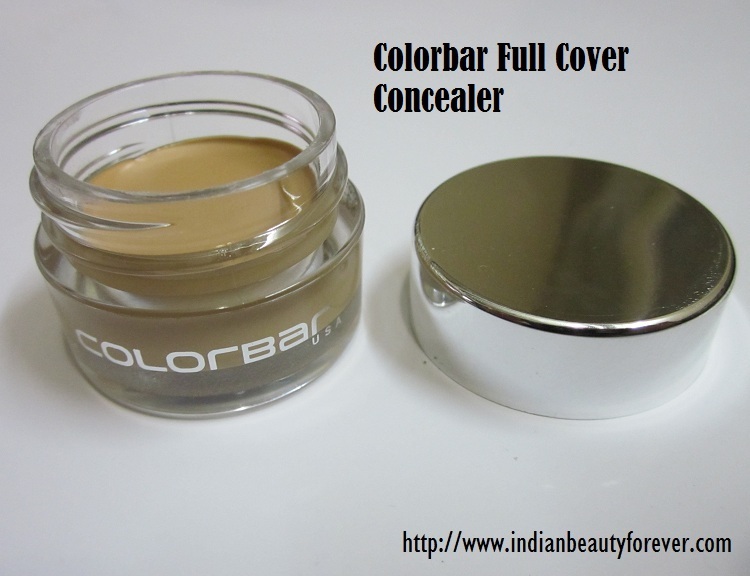 All right then time for its pros and cons of Colorbar Full Cover Concealer. Price is okay since a little can go a long way. It does not have any fragrance. Does cover nicely and gives a less than full coverage. Gets a bit dry over the time so taking a little between your fingers and then rubbing can warm it up a bit for better application. Tub pack makes difficult to use with fingers. using a brush would be better. My take: It is a decent product. If you need a concealer for a flawless skin, then do try it. It works pretty well provided you get the right shade and don't mind spending that much. You have to be careful in using it as it dries fast. Even that is the only problem i think it has. Looks good! You said it gets dry but does it appear patchy too? It dries but while applying it gets warmed up and blended easily. Nice review....mine dried up very soon....may be I don't apply it regularly may be once or twice a month! Thank u Puja. may be due to the whether or i use it when i do eye makeup. not regularly as i do not used makeup daily. I like this review! It's sad that this concealer gets dry, but that's because it is not oily. Acoording your pictures looks like it covers skin very well. Thanx Sukanya. :) beginners may find it easy to just pat it and blend the edges so as to not make it obvious. I can understand dear. Even i do not use them daily. wow very nice review..do u use it under eyes? Yes, preetha, it is creamy enough to make the circles less visible. But i apply very lightly and set it with powder else they can crease. :) Hope you like it dear. hey Prachi, for under eye dark circles so far the Aroma Magic cream has helped but even i have not found any sure shot way yaar.. still searching. since most of the under eye products does not seem to work effectively on dark circles. will it hide my acne scars..?? I too had bought this to cover a pimple mark and I have the same shade. Agree on the coverage but mine dried up within 6 months of buying :( It's not hard yet but it's too dry to spread on the skin. So not worth the price. i think may be its too thick due to that. I will try putting it in a hot water with lid closed tightly. Let's see what happens. maybe it gets more creamier. how do i follow your blog? i love your reviews! You can either put in your email address, join via google Friend connect, facebook or twitter. They all are on the right side bar. Nice review! Btw does it crease?? Thank dear, it does crease like most of the concealers if used too much or have lots of lines. I've seen so much about this brand from Indian vanity case! I love the shades of eyeshadows and blushes from them! In terms of concealers I'd love on from laurier mercier or mac this year!